Wow! 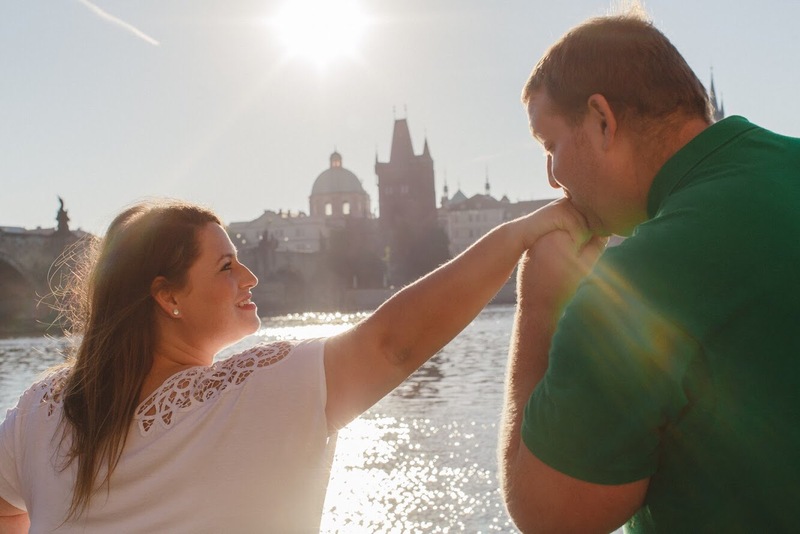 We’d both heard so many amazing things about Prague but we were so blown away by this charming city! Neither of us really knew much about it or what to expect, just that it was a place we had to visit. As we start talking about these Central/Eastern European countries, we have to mention about the roads and requirements for driving on them. Instead of toll roads here, if you drive in the motorways you are required to buy a “vignette”, a little sticker that goes on your windshield, or an electronic version (Slovakia and Hungary use electronic license plate recognition, Austria is phasing into electronic) to show you’ve paid for any length of time. The minimum is a 10 day vignette that costs around €10, then 1 month, and 1 year. They are sticklers! Don’t think you can risk it by not buying one if you plan to take the highways. They are serious and the fine for not having one is pretty hefty. You can purchase them at gas stations closer to the border, stands just before the border or at the official purchasing point just past the border. For Czech Republic, we found a gas station just over the border into CZ from Germany who sold it as its quoted price online and that was it, easy peasy! Plus, the gas station also sold this Fanta in a blue bottle that is Elderflower Lemon, so if you find yourself at the gas station buying a vignette, treat yourself to that amazing elixir too! We noticed as we were heading closer to the border that there are a lot of different stands selling the vignettes and a lot of them take a commission (and are cash only in the local currency. The official booths take credit cards), so if you’re planning to drive through these countries like us, just make sure you’re looking up how much it’s supposed to be and don’t pay more than that! The public transport was absolutely fantastic. Similar to other cities, you can buy a 24 hour pass (or more if you’d like!) and use it for unlimited rides during that period on any mode of public transport. Prague had buses, the metro and trams. All were very precisely on time and easy to use. After checking into our hotel which we found on Hotels.com through Ebates for all our perks (please click our links and make a purchase so we get credit!) we had to check out the gorgeous architecture here. Dancing House was at the top of the list. A hotel right in town, designed by one of Dean’s favorite architects, Frank Gehry. This building legitimately looks like it’s dancing! It was definitely a fun sight. It was nice to walk around along the river and look up in awe at all the buildings. Each one more beautiful than the one before. A chef friend of Dean’s (Hi Matt!) who had been here a few months earlier told us about a farmers market that goes on right along the river on Saturday mornings and since that was our first day here we made it a point to get up early to check it out! The tram outside our hotel room us right there and within minutes we were fully immersed in the local culture, unable to decide which booth to start at first. Because the market was right along the river, the views were gorgeous and the best part? SWANS! So many swans! All floating around making the sight that much more magnificent. We had so much fun taking their pictures. Sometimes it’s all about the little things! We got some traditional pastries here for breakfast and couldn’t pick a favorite, all so delicious. Dean’s great grandparents were from Czechoslovakia so he immediately recognized some the baked goods and pastries who’s recipes were handed down and made for him by his mother. It was fun for him to recognize things and taste them to compare, and it was fun for me to watch his eyes light up while he was doing it! After walking around the market and getting our fill of pastries and swans we went to get a good view of the Prague castle. 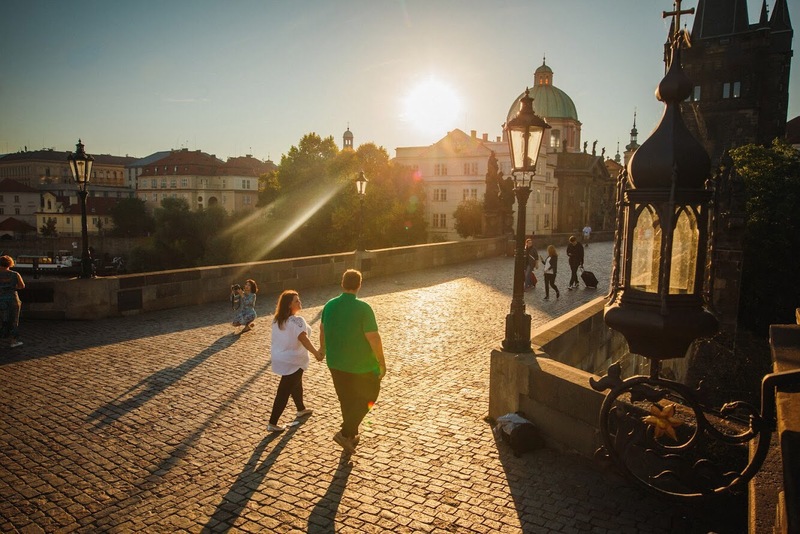 We hopped off the tram at one of the bridges to get some good photos and then walked over to the Charles Bridge, the famous bridge in Prague. So many people! 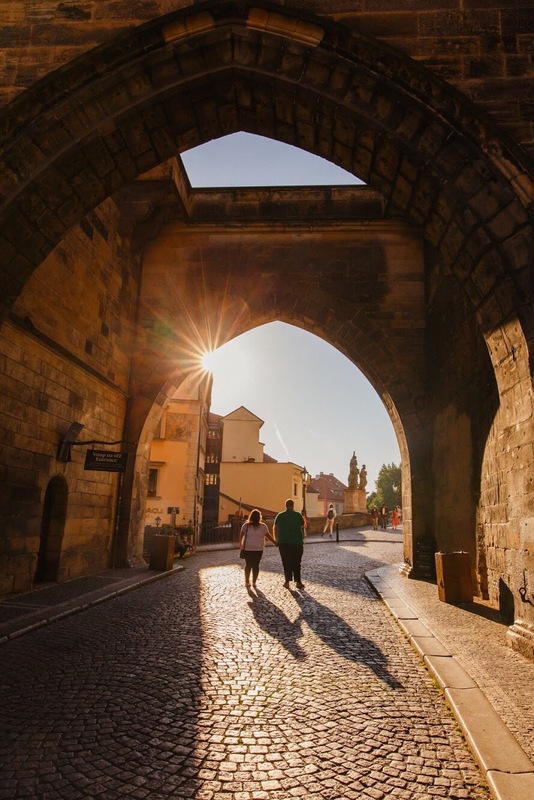 The bridge started its construction in 1357 and was finished in the 15th century. It was so amazing to walk along something with so much history! There are towers in either side leading onto the bridge and the entire sight is breathtaking. 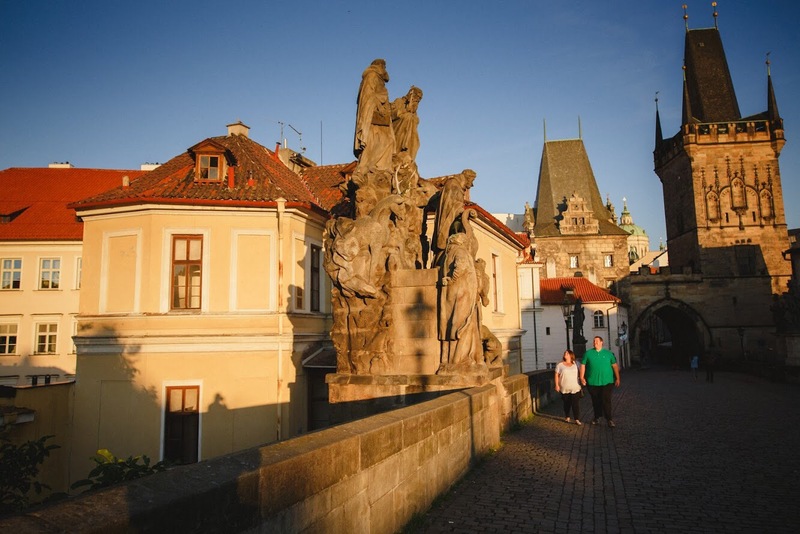 It was a little hard to weave in and around all the people and vendors selling things, but the views of Prague and the castle more than made up for it. 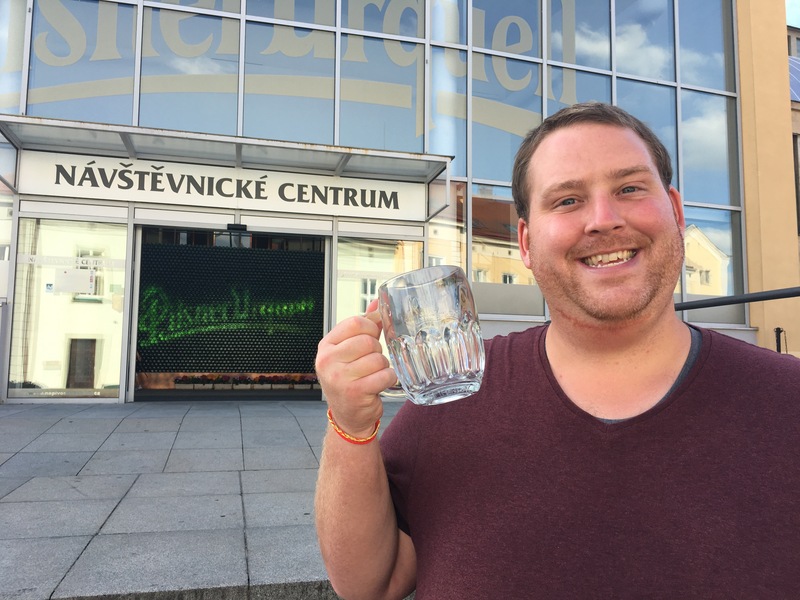 We’d heard from a few of our followers about a Beer Spa in Pilsen (the home of Pilsner!) about an hour drive from the city. A must do! 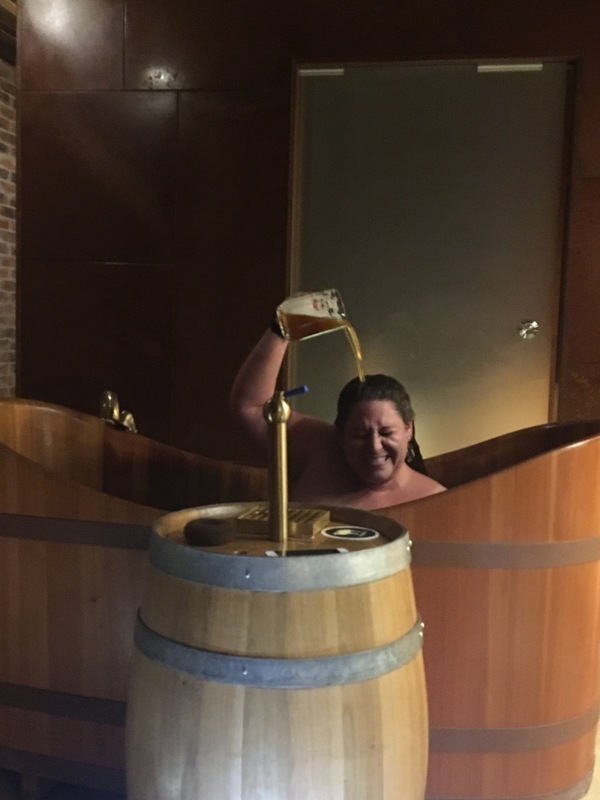 We managed to secure a reservation for their “beer bath” and headed on our way! Reservations are required and we recommend booking in advance so you can make sure to get a time and day that works for you. We were very lucky that we were able to secure a reservation the day of. 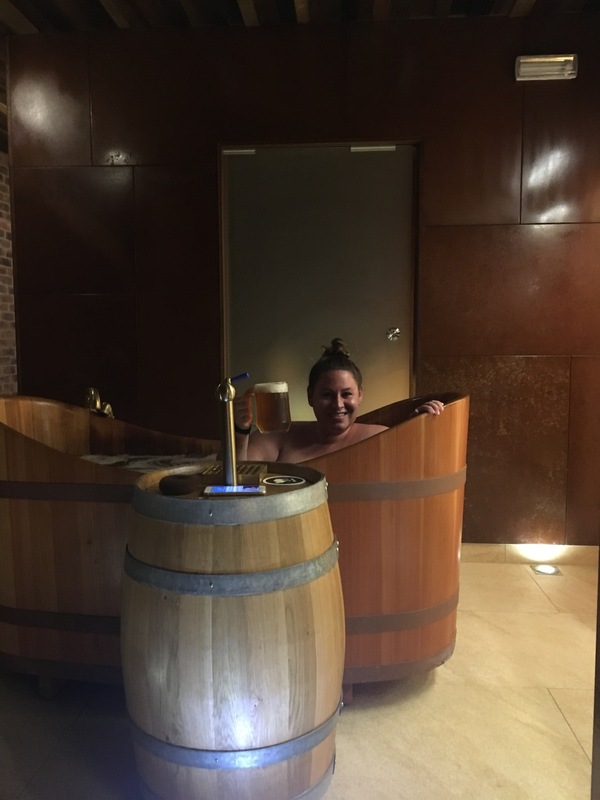 Purkmistr is a hotel, spa and restaurant and while we’re sure there are other beer spas around, we definitely recommend going to this one! 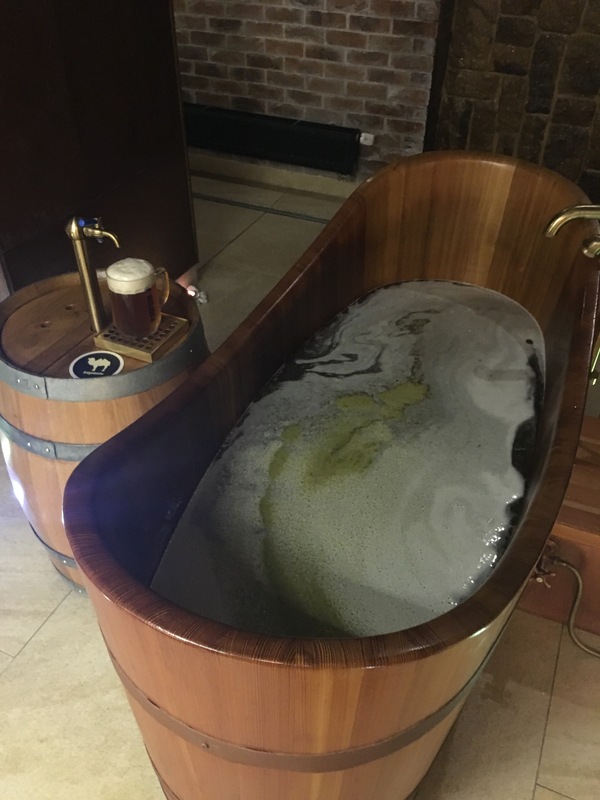 For around $30/person you can soak in a beer bath for 20 minutes with an additional 20 minutes in their “relaxation room”. Okay, you may be thinking… $30 for a 20 minute bath? Let us be clear when we say… IT WAS SO WORTH IT! 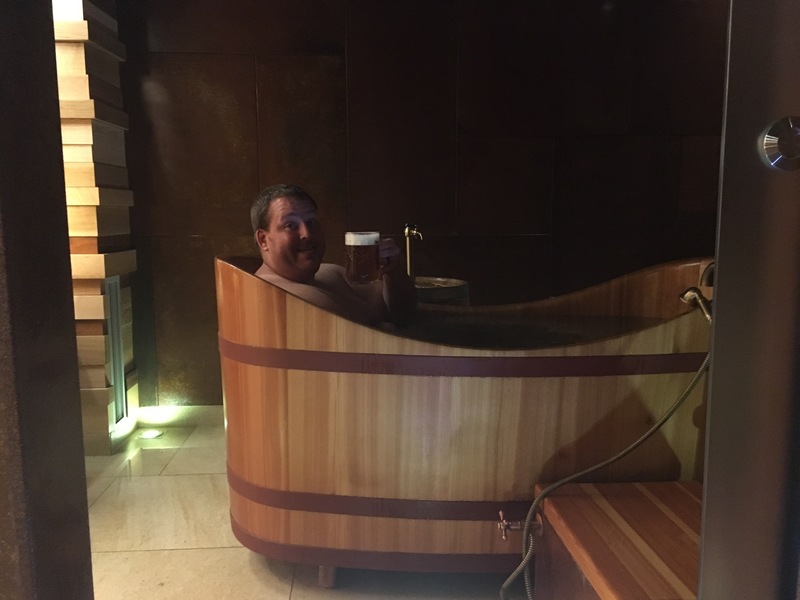 Yes, it’s legitimately beer in a bathtub. Yes, it’s warm. No, we didn’t drink our bath water. They do, however, have a free flowing tap next to each bathtub of only the finest ice cold pilsner (they’re own brew!) for you to drink as much of as you’d like! 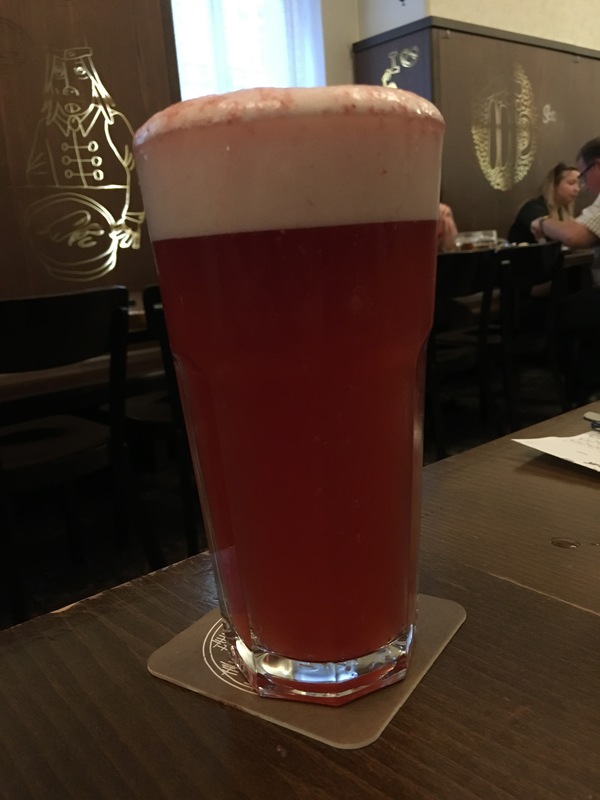 Beer is supposed to be very good for your skin and hair… who knew?! They had a bathtub for 2 people but since we booked last minute we had to do separate tubs, which actually turned out to be perfect. 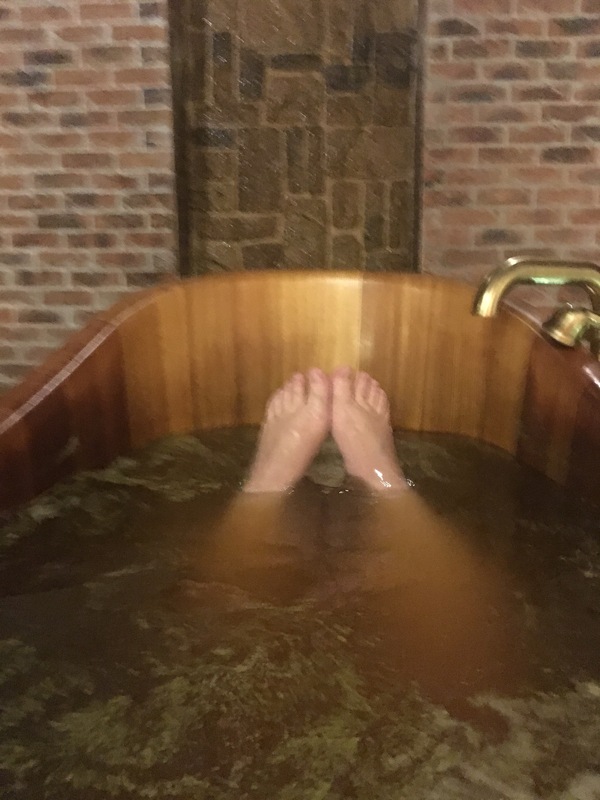 They have doors that open between the private rooms so it’s as if we were in the same room together and we were able to have a tub all to ourselves. It was SO much fun! One of the best things we’ve done on our entire trip for sure! 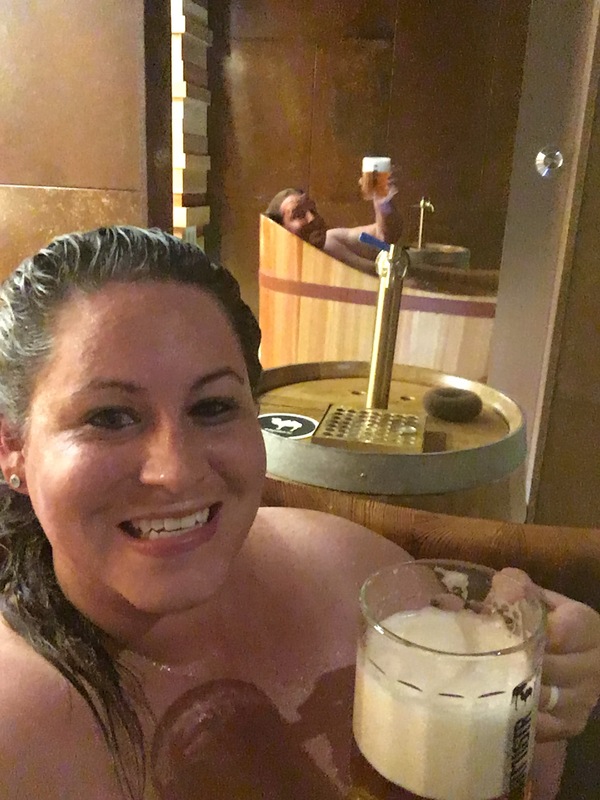 After our beer baths, time in the relaxation room and drinking lots of beer, we (safely and soberly) went over to the Pilsner Urquell brewery just a few miles away from Purkmistr. While they didn’t have any English tours left for the day, we were able to walk around and check out where this world famous beer comes from. We even got a glass with our last name engraved on it! 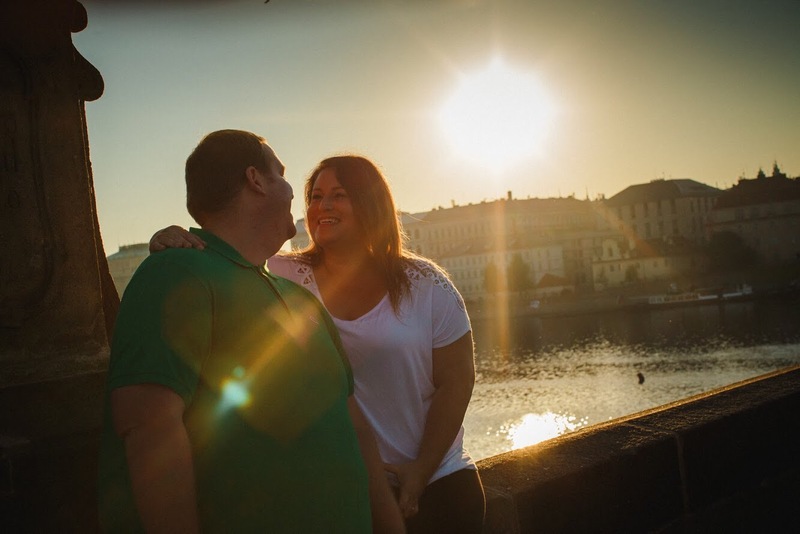 One of the highlights of our entire stay in Prague was getting hooked up with a photographer from Dovetail to capture our time in this gorgeous city. 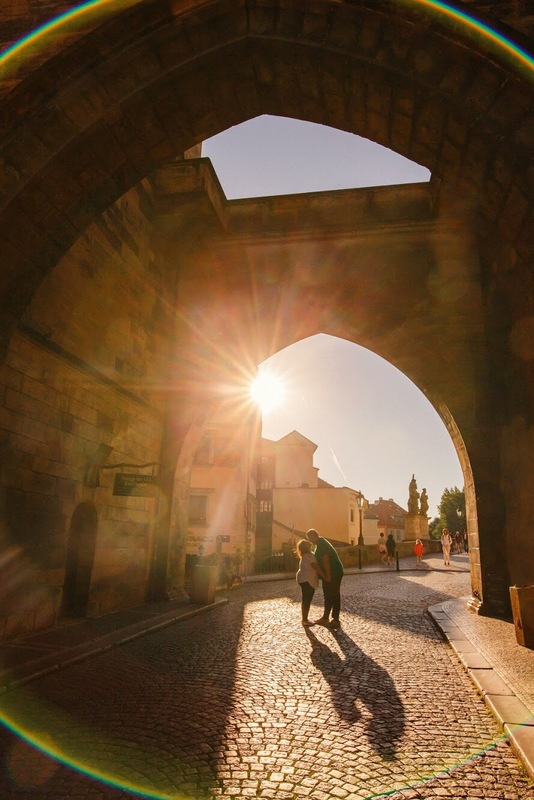 Dovetail is an international vacation photography company that connects you with local photographers in whichever city you’re in with one goal in mind, provide amazing, professional photographers for travelers looking to put their selfie sticks down, get everyone in the photo and get some real photos to remember their trip by. 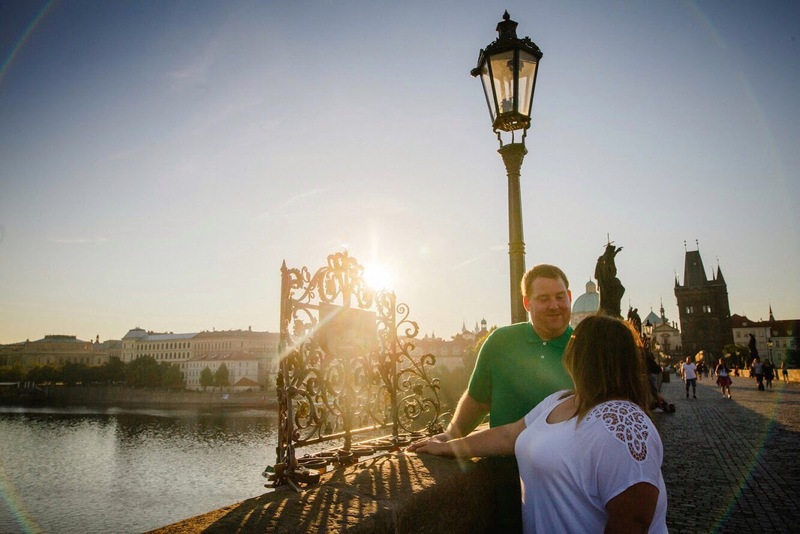 Kurt was our photographer and he had us meet him at one end of the Charles Bridge for some sunrise photos. We woke up at 4:30am and after putting on the nicest clothes we had, (which is hard when all you have is travel clothes!) we were on our way to meet him. Good thing to note – don’t miss your tram when it’s so early in the morning! True to fashion for us, we got to the stop just as our tram was whizzing by. We ended up having to wait 20 minutes for the next one! Kurt was very nice about it though, and was happy to meet us at our end stop so we could get started as soon as we got off the tram. It was truly an experience of a lifetime! As he took our photos with what he called “flare”, with the sun rays bursting out from behind us, he explained to us about the history of the bridge and some significant facts about it. That’s anther super cool thing about Dovetail, the photographers they hire are local to whichever area you’re in, so they can take you to, and tell you about, spots that are less touristy and more local. 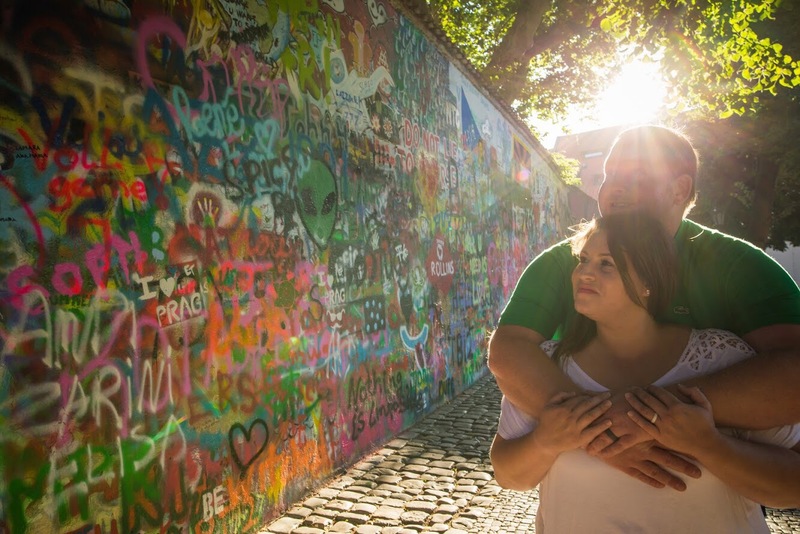 He took us down next to the bridge to a gorgeous dock overlooking the river and also to the famous “John Lennon” wall, something we didn’t even know existed! 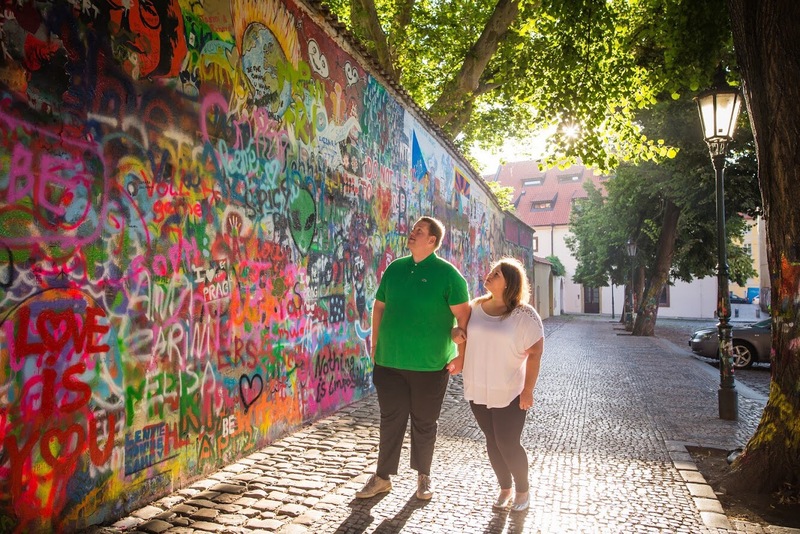 Since the 1980’s this wall has been filled with John Lennon inspired graffiti and is constantly changing. It’s occasionally painted over for a fresh canvas and refilled with all kinds of inspirational art and sayings. Apparently it’s usually packed with hundreds people, but we were able to see it all by ourselves given the fact that we were there so early! 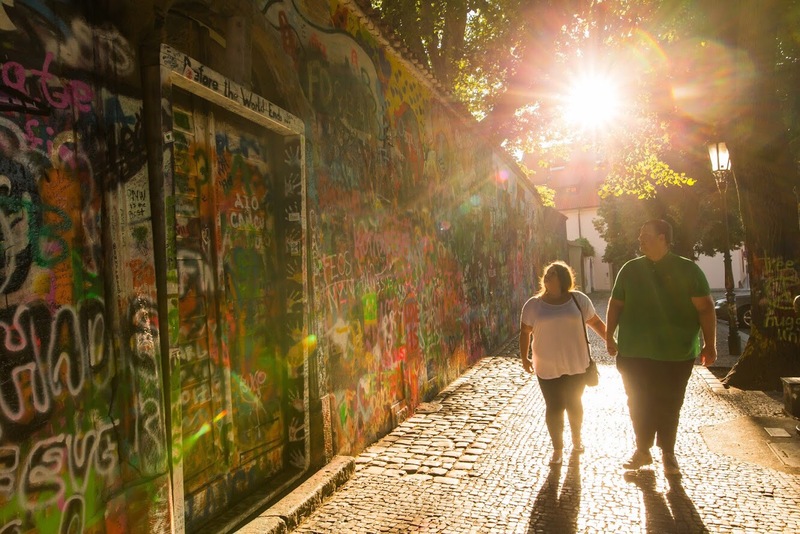 It was truly a once in a lifetime experience to be able to see Prague in such a different light (literally!) get our very own history lesson and have the entire thing photographed so beautifully. Within just a few days we had all our photos back to us. Much different than the 6 weeks we had to wait for our wedding photos! We couldn’t have done it without Dovetail! Head to their website (hyperlinked in the name, but also here it is just in case! http://www.dovetailexperience.com) to check them out! They’re available all over the world, so even if you don’t see your destination listed in their website, contact them, because they’ll be able to make it work for you wherever you’re going! Also take a look at their Facebook and Instagram (hyperlinked too!) to see some on their work, it’s truly gorgeous! We checked out another place close to our hotel and while it was average and really not worth mentioning, we feel we must say to you.. if you’re headed to a restaurant to try the local specialists and as you’re ordering the waitress asks you if you’ve had a particular dish and tells you it smells and tastes funny… skip it! We did this with their version of the fried cheese and a beer cheese dip. How could it be bad?! It was SO BAD!! Gross! 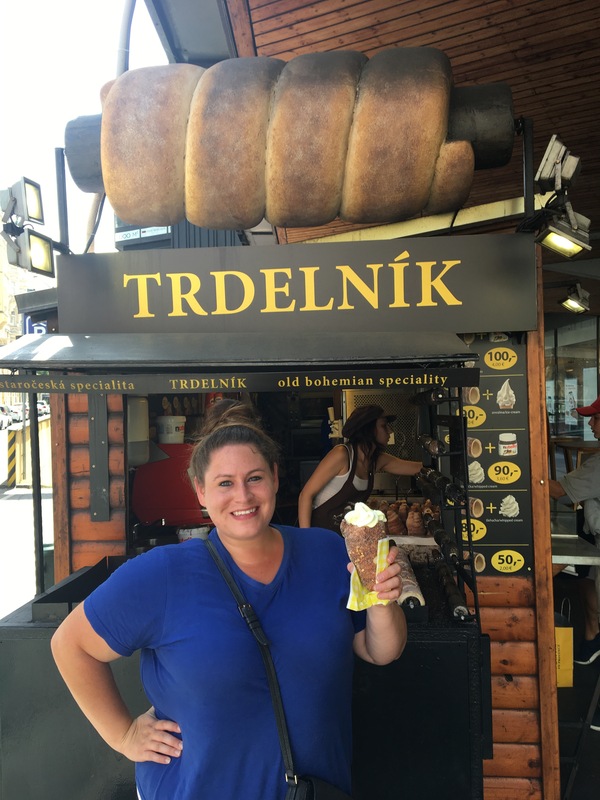 Another fun specialty of this area is Trdelnik. An ice cream cone to the max! 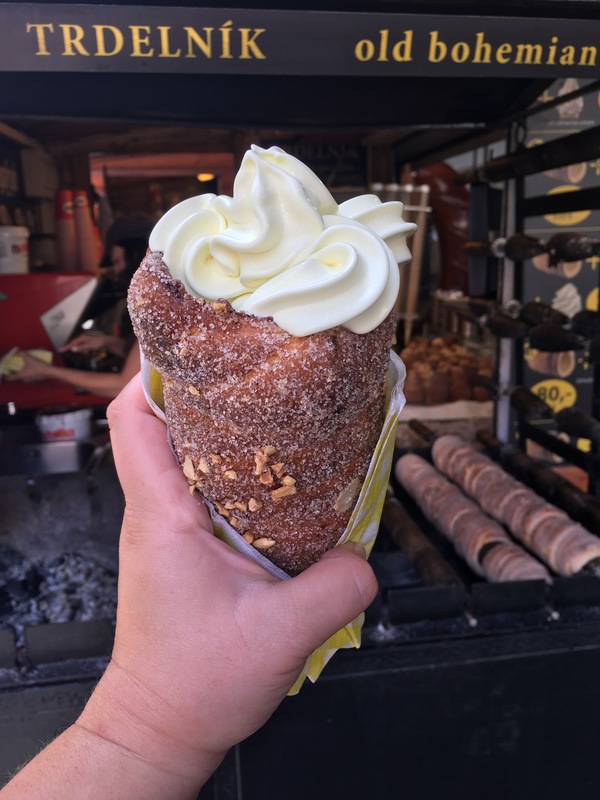 The cone was some sort of cake/bread roasted over a coal fired spit, coated in cinnamon sugar and almonds, which was then filled with a layer of Nutella and a heaping portion of creamy frozen custard. One was more than enough for both of us and it was incredible!!! 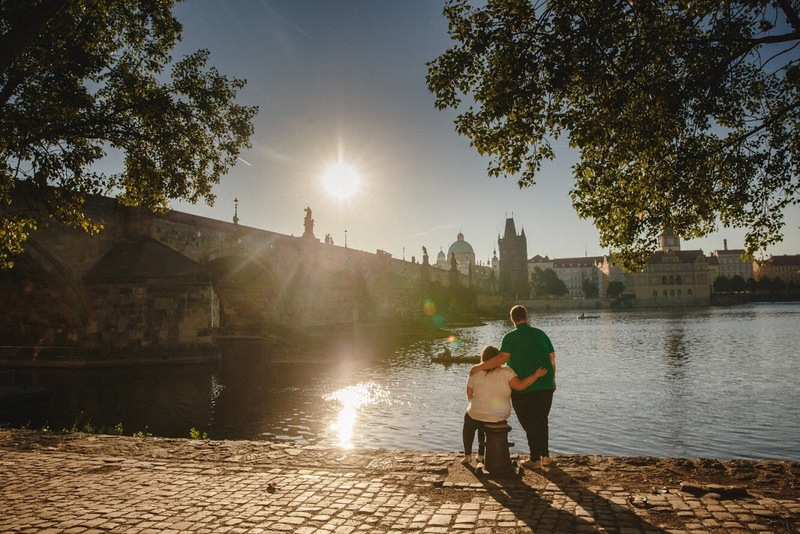 Prague was a magical place. Another city to add to the list of places we must come back to explore more of! 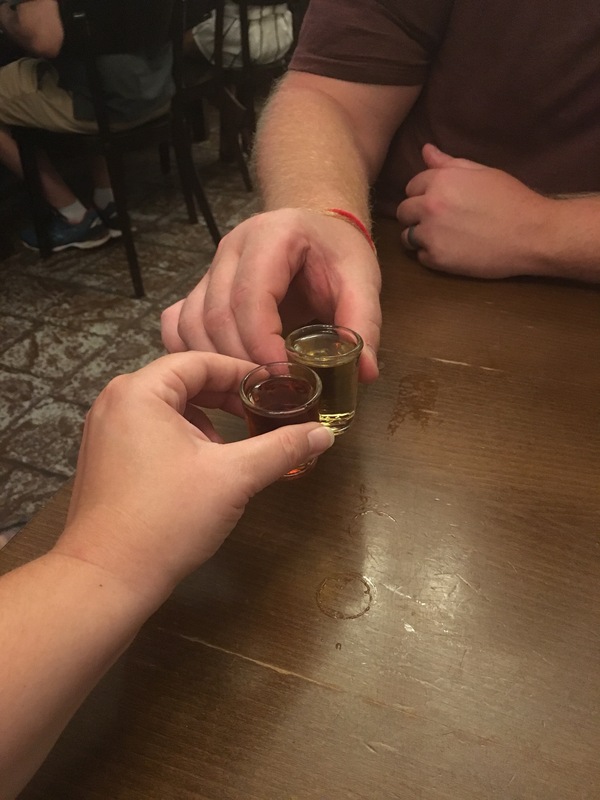 Next up on our whirlwind through Central Europe is Budapest! Previous PostBerlin, Germany: Currywurst, Chocolate & The BEST Kebap! 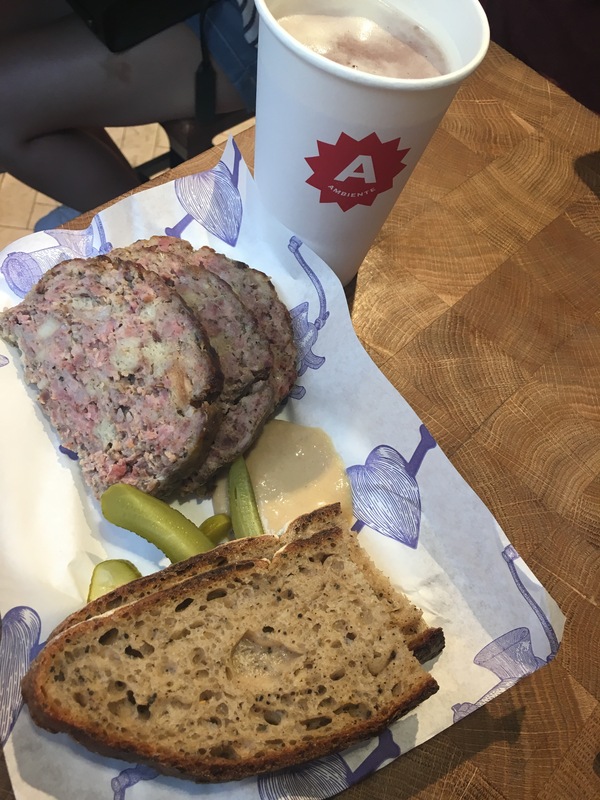 Next PostBudapest: Filling Our HUNGARY Bellies! Love the idea of the Dovetail photographer, and you got some great photos out of it. Very nice!